Cardiff Bay is a wonderful place to visit. 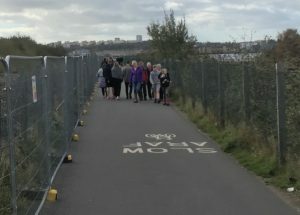 Whilst there, as many as 150,000 people a month take a stroll from Mermaid Quay around the barrage to take in the views. 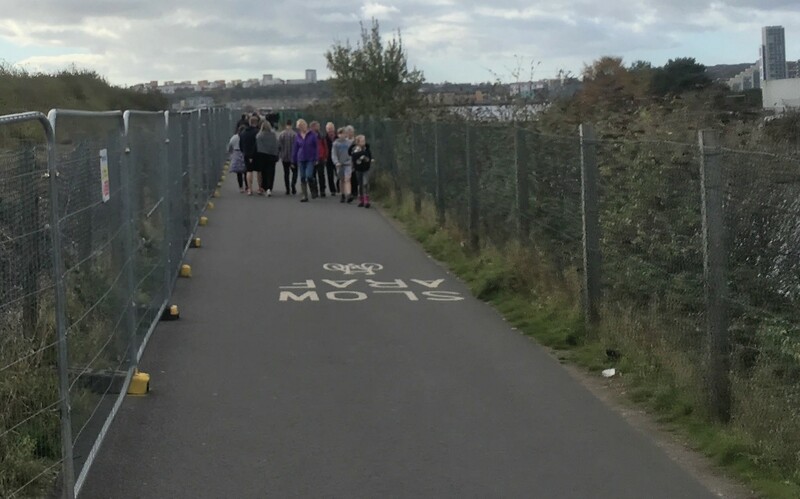 This involves walking past the Norwegian Church and (ex) Dr Who Exhibition and, until recently, down a long, narrow stretch of path roughly four metres wide, sharing with people with dogs, pushchairs, on roller-skates, and of course, cyclists. Due to the nature of the area, and obvious plans for future development, the path has always been temporary. However, as footfall has been noticeably rising with resulting increased conflict between users, the council recently decided to give it an upgrade. Another reason of course is that the barrage is being used in 2018 as the Volvo Ocean Race festival site, but perhaps that’s just coincidental. The work took around six weeks, with the final twelve days seeing the barrage route closed completely to all through traffic. The path begins just after the environmental centre. The tarmac has been machine laid, giving it a smooth finish, increased in width to around 7 metres (23ft). The drains have been re-located and are flush with the surface, so no more bouncing up and down when riding across them. Speaking of which, there was some surface water but very few puddles, although it hadn’t been raining particularly heavily. At the section that joins to the dock-side path there used to be a pair of 90 degree corners. These have been replaced with a more gentle left-right sweep, which will certainly improve safety in icy conditions. 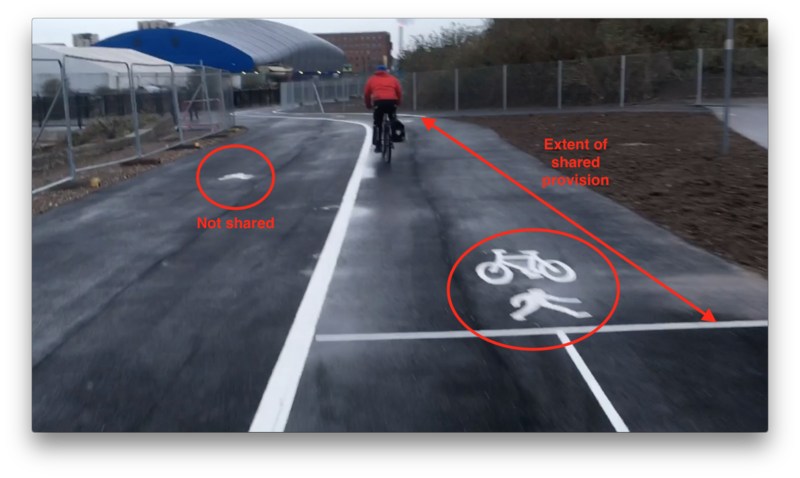 Just before this section, however, there is a short section where the cycle path is re-designated as shared provision. The reason for this is puzzling, as it’s literally only 10 metres or so. 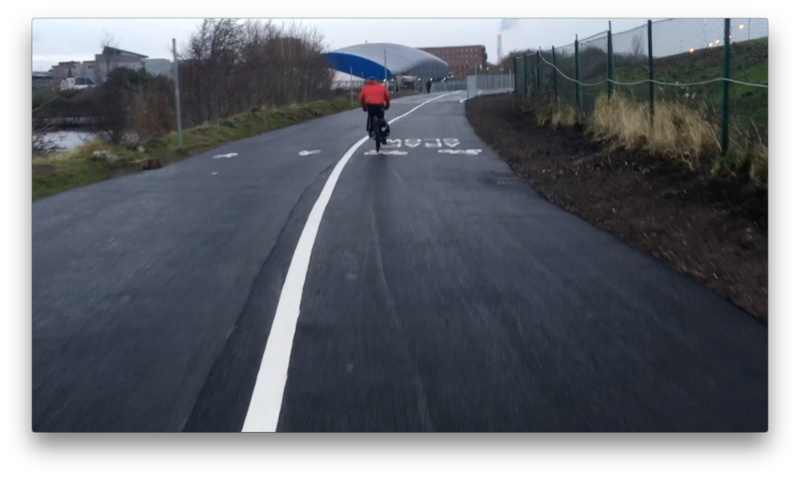 The improvements on dock-side section of the path are impressive when you consider it is roughly double the width that it was before. 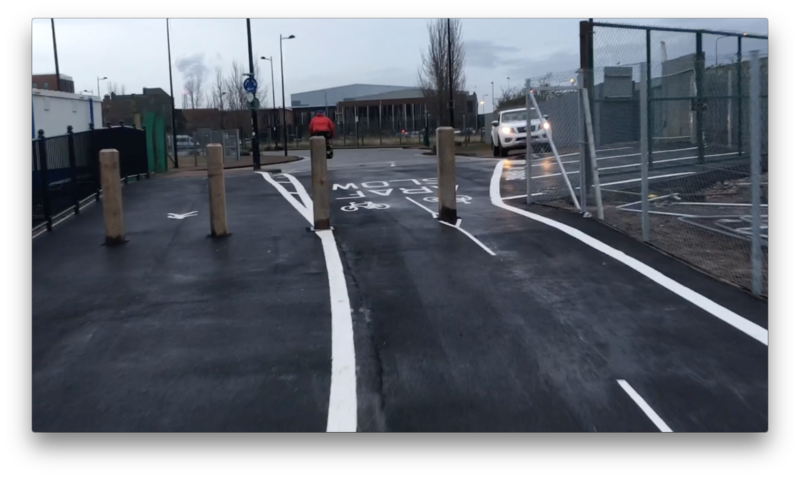 The finish on this side of the path is noticeably better than the opposite side, with a proper kerb and high quality railings, the same as elsewhere in the Bay. Intriguingly, there are also a couple of poles that look suspiciously like lamposts. This would definitely be a welcome addition! Finally the path rejoins the existing provision by the old Dr Who building. 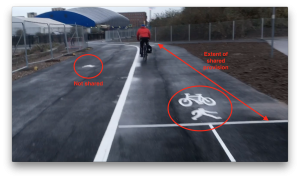 Whereas before it continued on to the shared pavement adjacent to the road, the cycling section of the path now exits directly on to the carriageway, meaning you don’t have to choose between sharing with pedestrians or bumping down a high kerb. If the success of this scheme is measured by improving what was there before then it has definitely delivered. But does being twice the width mean it’s twice as good? Ultimately, this path suffers from the same issues as many other off-road paths in Cardiff, for example in Bute Park. Is it a commuter or a leisure route? Is it a pedestrian or a cycle path? Who has priority? What’s its purpose? There was an opportunity here to clarify this issue. One thing that has remained the same on the path is the painted segregation. 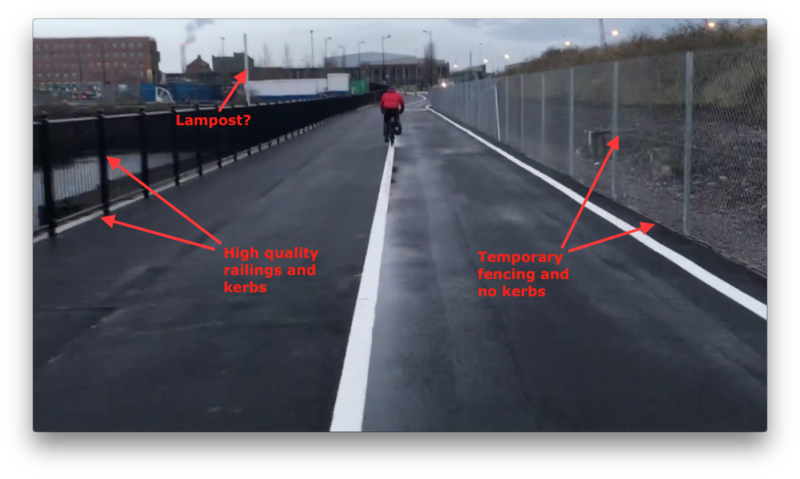 Why not build a physical barrier or kerb separating the cycling and walking sections? 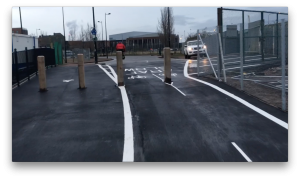 Or at least use different coloured tarmac? There could be a number of answers to this question, however, we suspect the main reason is that the path is still temporary. The council will be reluctant to spend money on something that will probably be ripped up and replaced in the next few years when the whole area is redeveloped. 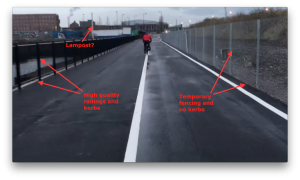 Another concern is that the path is now wide enough to drive motor vehicles along. Even if it were only occasionally (say for special sailing events) the temptation might be to use it more and more, as seems to be happening across the barrage from the Penarth end. There has long been speculation of a bus service using this route, the implementation of which could be a disaster for the entire area. We seriously hope that this isn’t the case. A low-tech, instant solution to the lack of segregation (with the additional benefit of the ability to roll it out across Cardiff) : Can we not find a public-spirited company to place some sponsored flower-tubs along the central white lines – cheap, instant segregation of pedestrians and cyclists and it gives low-cost advertising for said company. If proven to be effective it will make the case for permanent segregation much easier.